In the previous blog post, I talked about a tragedy in Gang Nam Station, Seoul. A young college woman was stabbed to death in a crazy murderer attack. This murder thought women always ignored him so he planned to kill ‘any’ women on that day. Yes, this is heinous crime and now we (Koreans) are at a loss what to do. There was a heated debate about the right of women in Korea for a long time but after this crazy incident, the debate about ‘living as women in Korea’ brings related hot arguments among people, especially in various social media such as Facebook and Twitter. A Yeo-hyeom phenomenon is an example. Yeo-hyeom is a new coined Korean word and it means an attitude that someone (mostly (some sort of)men) hates women abnormally without obvious reason/ or someone hates women abnormally because women are women. Of course, I cannot generalise ‘every men’ in Korea have Yeo-hyeom mind to women, some of men in Korea, I hope. But the one obvious thing is there is a debate about this phenomenon (Yeo-hyeom) between men and women. For me, as a women who lives in Korea, I was also furious when I read this crazy incident and I understand why there is a continuous argument about this tragedy what ‘men’ did to ‘women’. I know it should not be a dichotomous fight between ‘men’ and ‘women’. But, what do you think? This murderer killed that young women only because he hates women. Then? This means that that young women shouldn’t be killed by that psycho if she wasn’t a woman. In other words, it could be any women. It could be me, my friends, my neighbours anyone who are women in Korea. That’s why this phenomenon brought us to think deeply about the issue of ‘Yeo-hyeom’ in Korea and we (women) now decided to fight with them (maybe men? or any one/any society who hates women without obvious reason. Women shouldn’t be received unfair only because we are women. Why do we have to worry about going to public toilet? Why do we have to worry about being killed by anyone on the street? Why? I don’t want to generalise that ‘all men has Yeohyeom’.But one thing is obvious that this society wants women to be ‘womanly-women’. And people (both men and women, not everyone) in Korea pointed to ‘not enough womanly-woman’. There are gender stereotypes in every culture and Korean society also have ‘stereotypes about women’. I think we (women) should deny these ‘stereotypes about women’ that decided by ‘others’. At the same time, we (women) should also deny the ‘stereotypes about women’ that were inherent in ourselves, too. 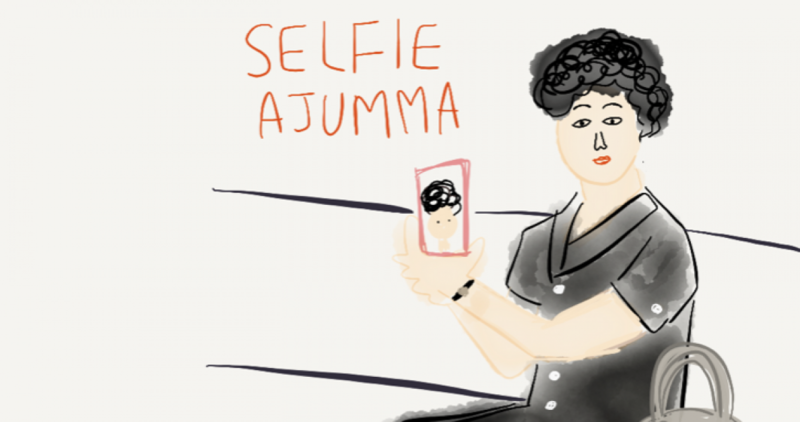 Posted on 28 May 2016 28 May 2016 by moon ajummaPosted in Smart Ajumma (English)Tagged blue and pink, gender, 한국여성, 여혐, Korean women, men and women, stereotype, womanly, Yeohyeom. Next Next post: Respect ‘others’.